Castle hotels in UK. Extraordinary ideas for UK romantic breaks & getaways. One of the a unique luxury Castle hotels in UK, located in the picturesque village of Amberley at the foot of the South Downs. 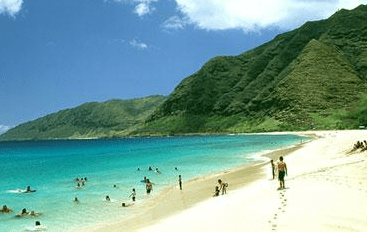 A great destination for UK romantic breaks. 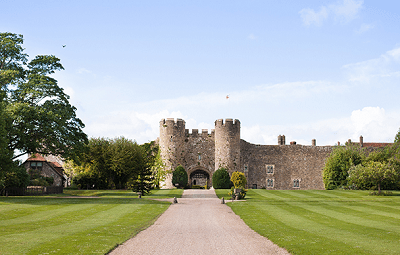 Privately owned by Andrew and Christina Brownsword, this magnificent 900-year-old castle is enclosed by a 60 foot high curtain wall and portcullis that remains open, behind which you will discover an enchanting hotel offering the highest standards of food and service. 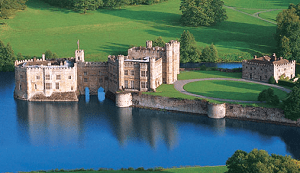 With 500 acres of beautiful parkland and formal gardens, daily events and year round attractions, Leeds Castle is one of the best castle hotels in UK & of the best days out in Kent, you will want to come back time and again! One of the most magnificent castle hotels near London. Its splendid panelled rooms contain fine furniture, tapestries, antiques and an important collection of Tudor portraits. 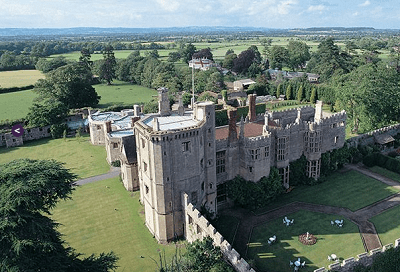 One of the most unique castle hotel in UK, an extraordinary destination for romantic breaks & getaways. 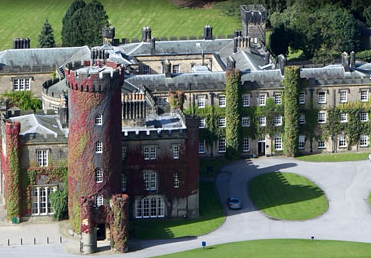 A luxury castle hotel in the Yorkshire Dales, with fine dining, cookery school, spa and extensive grounds. Owned by the Cunliffe-Lister family since the 1880s, and the ancestral seat of the Earl of Swinton, guests at the hotel enjoy an authentic stately home experience. Rooms are furnished with antiques and family portraits, with the warmth and grandeur of a traditional English house. One of the most unique castle hotels in UK for romantic breaks & weddings. Step back in time in this extraordinary Tudor castle on the edge of the Cotswolds. This hotel offers the perfect luxurious retreat – combining 500-year-old architecture with sumptuous facilities. 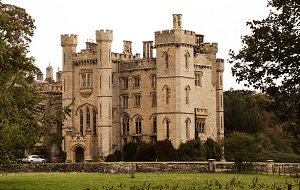 Thornbury Castle is a place to de-stress – take a stroll around the manicured lawns and landscaped grounds, book a massage in your own bedchamber and relax over a delicious meal in our exclusive restaurant. 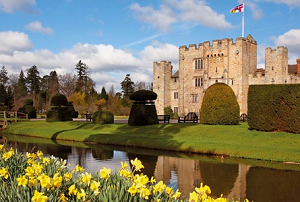 One of the unforgettable romantic getaways & castle hotels in UK. Dalmunzie Castle is a stunning quintessential Lairds mansion turreted in the Scots Baronial style & standing proudly at the head of a 6500 acre estate dating back to 1510. 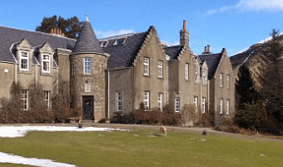 Enjoying magnificent mountain scenery, Dalmunzie is a classic country house hotel located in a hidden part of Highland Perthshire, yet is less than two hours from Edinburgh airport. This amazing place is among the most romantic castle hotels in UK, a great destination for unique UK breaks & getaways. 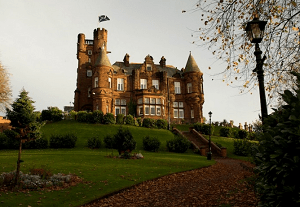 Sherbrooke Castle Hotel is a magnificent 4 star baronial hotel crafted in rich red sandstone and set in beautifully landscaped gardens in the leafy suburb of Pollokshields in Glasgow’s Southside. Sherbrooke combines traditional grace with modern efficiency. Prestige with convenience. The result is a unique experience in one of the most charming castle hotels in UK for unforgettable UK romantic breaks. A genuine experience. The Sherbrooke experience. Otterburn Castle Country House Hotel nestles in 32 acres of its own estate in Northumberland, fronted by terraced lawns and surrounded by woodland. It is an excellent venue for a holiday, a wedding, a conference and winning & dining in our award winning restaurant. The gardens stretch down to the village of Otterburn. Beautifully restored with the original features of oak panelling, leaded panes, stained glass, creating an ambience of warm, cosy homeliness. The 17 rooms are all en-suite with the old library now a master suite with a four poster bed and every comfort. Standing proud since the 14th century, Duns Castle is in a unique location in the Scottish Borders, surrounded by tranquil parkland, on the outskirts of the small market town of Duns. This exceptionally peaceful castle has been home to the Hay family since 1696, and now welcomes guests from around the world to experience the luxury of accommodation in an exclusive-use private venue with superb hospitality. One of the most romantic castle hotels in UK for romantic getaways, breaks or weddings. 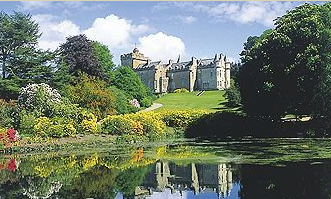 Glenapp Castle was built in 1870 – a strikingly beautiful example of the Scottish Baronial style of architecture. 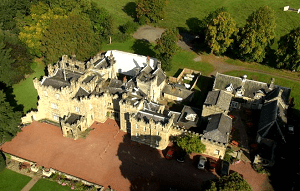 Designed by the celebrated architect David Bryce for Mr James Hunter, the Deputy Lord Lieutenant of Ayrshire, the castle’s mellow sandstone battlements are topped by soaring turrets and towers, earning Glenapp a rightful place as one of the most romantic castle hotels in UK & Scotland.